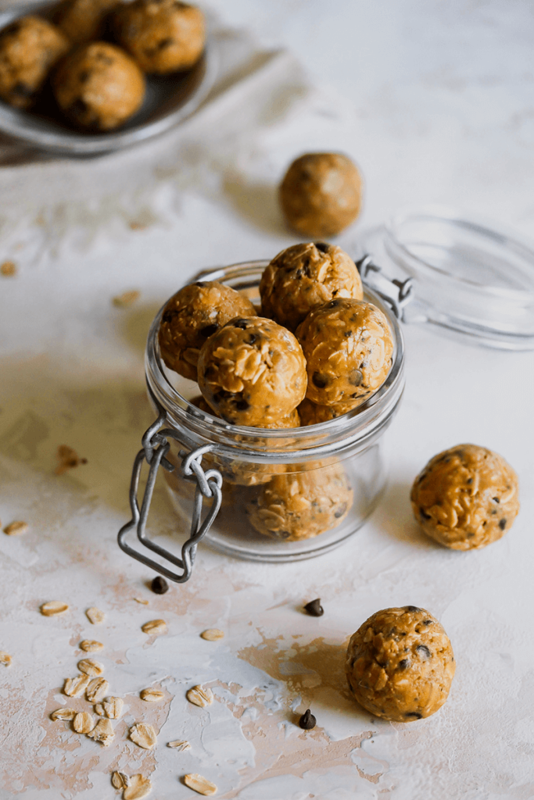 Looking for a healthier cookie option? 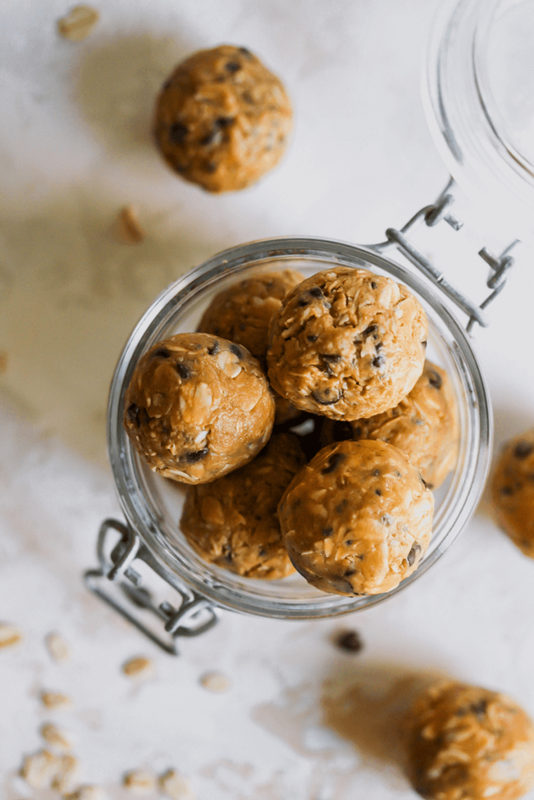 These No-Bake Peanut Butter Chocolate Chip Cookie Bites double as a dessert, snack or even breakfast. They’re delicious, easy and versatile! We have a house full of sweet eaters so I am always looking for a clever way to enjoy sweets but with some additional nutrition benefits. 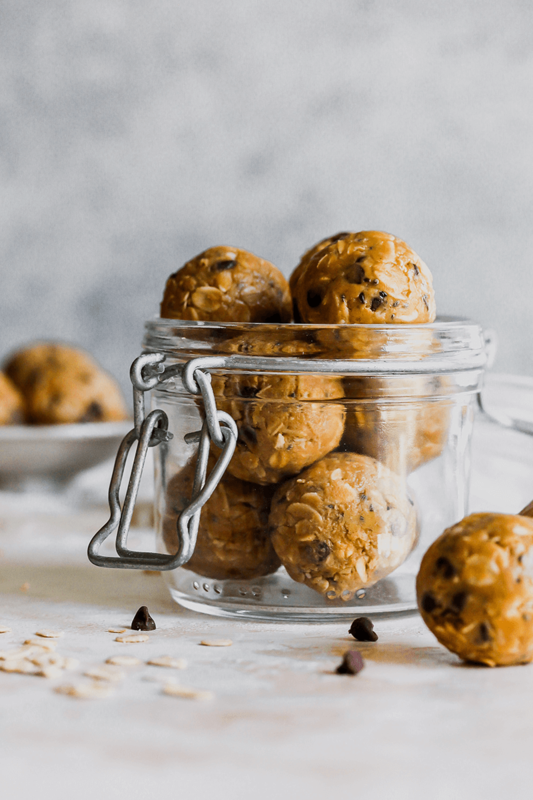 Enter these no-bake chocolate chip cookie bites. 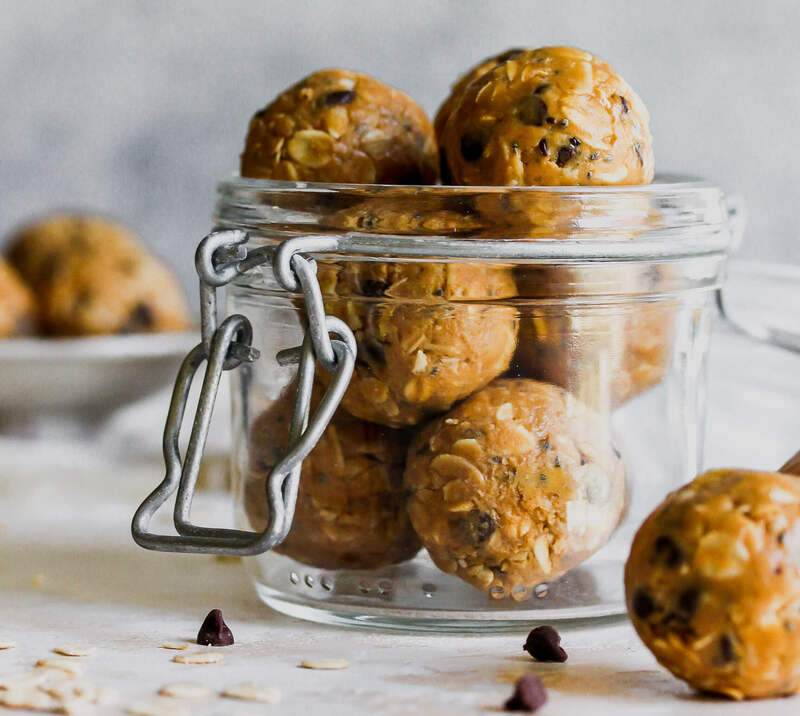 The recipes uses fiber-rich oatmeal as the base and then binds them together with protein-rich peanut butter and a hint of honey. We like using peanut butter the most but you can also sub in almond butter or make them nut-free with sunflower seed butter. Whichever option you choose, they taste delicious and are sure to be a family favorite recipe. Check out my clever tips below on how to make prep hassle free as well as a few other flavor swaps. Also, don’t miss the Facebook Live of the girls and me making these cookie bites at the bottom of the page. It was quite the adventure!! Measure your peanut butter without the mess by spraying your measuring cup with cooking spray first. The peanut butter will slide right out. Want to cut back on the sugar? Use half the honey and add a tablespoon more peanut butter. Add chia seeds for an extra fiber and a boost of protein. 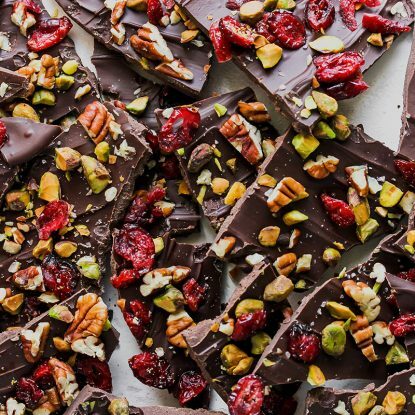 Swap out chocolate chips for dried cranberries. Or add them both! 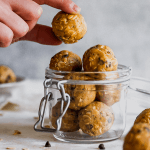 Use a cookie scoop to evenly measure balls. Roll gently in your hands and then transfer each ball to a cup in a mini muffin tin. Chill. 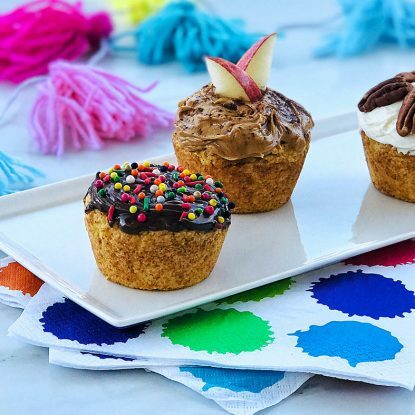 The mini muffin tin keeps the cookie bites from rolling together. Catch more quick tips in our Facebook Live (and listen to the crazy hail storm that blew up!!)!! Do you have a favorite “healthier” dessert option? I also love these Peanut Butter Chocolate Chip Blondie Cups which add chickpeas for additional plant protein. Stir together oats, peanut butter (or almond butter), mini chocolate chips, and honey in a medium bowl. Add chia seeds and/or turmeric, if desired. Evenly divide mixture into shape into balls (makes 12-14). Refrigerate for 15 minutes or until firm. Store in an air-tight container in the refrigerator. Looking for a healthier cookie options? 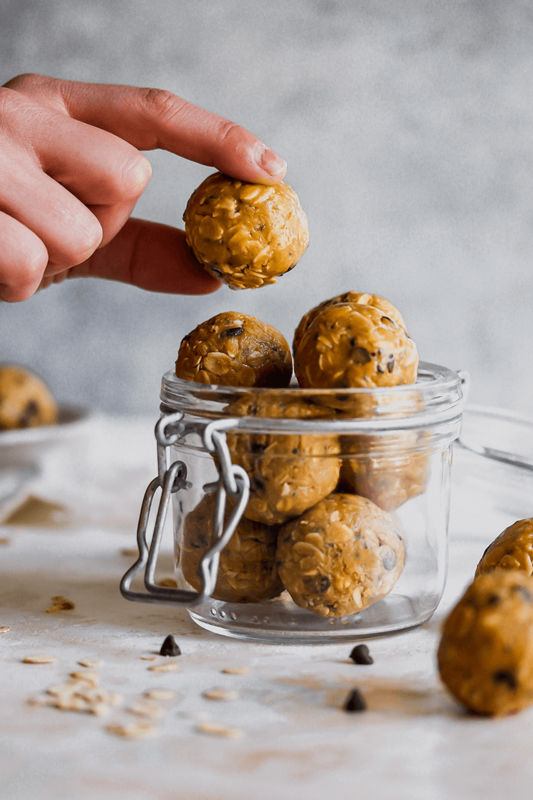 These No-Bake Peanut Butter Chocolate Chip Cookie Bites double as a dessert, snack or even breakfast. They're delicious, easy and versatile! We love these type of bites. I love your tip on spraying measuring cup first to prevent sticky PB mess! Thanks, Lauren! It makes measuring so much easier! Thanks for this recipe. It took me five attempts to perfect it. My son loved it. Hi! I’m so glad to hear that your son loved it. Let me know if you had to make any alterations to the recipe to get it to work for you.